This "best of" volume celebrates Vogue Knitting's thirtieth anniversary and is a must-have for knitters at all levels. Whether you are a young or an old knitter, a novice or an expert, one thing remains true: Vogue Knitting magazine is the bible for innovative and inspiring knitted garments. In the past decades, the handcrafted revolution has converted lovers of fashion and young people alike into obsessive knitters. Vogue Knitting, the most respected knitting magazine in the world, has served as an indispensable how-to guide for knitters with its beautiful and intricate patterns. This must-have volume features the most sought-after patterns of Vogue Knitting from its launch in 1982 to the present. Reproducing more than eighty full-color patterns by renowned designers such as Marc Jacobs, Twinkle, Oscar de la Renta, and Cynthia Rowley, as well as various legends within the knitting community, this volume combines classic and cutting-edge styles and will remain a timeless and essential book for knitters of all levels and styles. From sweaters to suits, from elegant to edgy, Vogue Knitting features a range of patterns for beginners and experts alike. 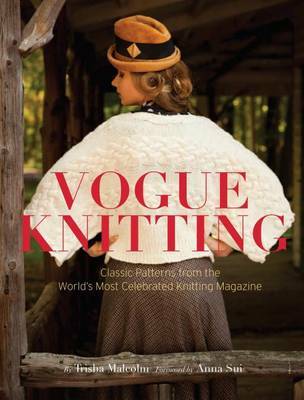 In essence, this volume embodies what Vogue Knitting has stood for over the past thirty years: inspiration, luxury, creativity, and fashion. "This must-have volume features the most sought-after pattens of Vogue Knitting from its launch in 1982 to the present . . . this volume combines classic and cutting-edge styles and will remain a timeless and essential book for knitters of all levels and styles." "This book can serve as a reference point for the evolution of fashion for many decades to come . . . for anyone who is serious about both the craft and design, this is a powerful tool to have in your library."